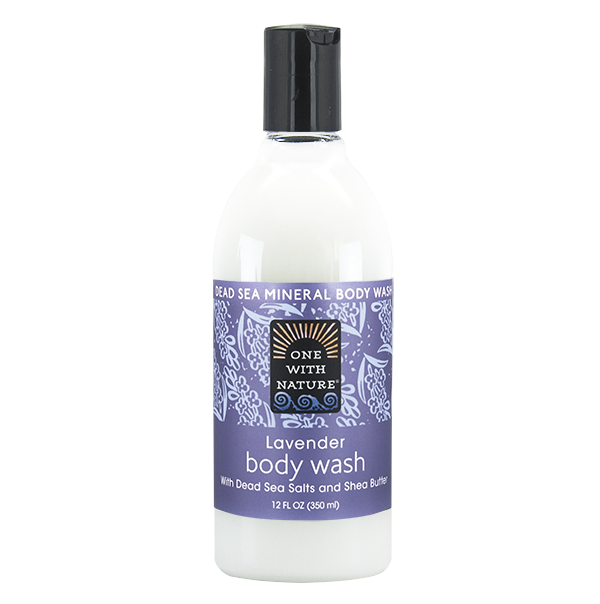 This Lavender body wash made with pure Dead Sea mineral salt improves the appearance of skin by balancing and maintaining moisture levels. Lightly and naturally scented. INGREDIENTS: Aqua (Water), Cocamidopropyl Betaine, Sodium Coco-Sulfate, Maris Sal (Dead Sea Salt), Glycol Distearate, Guar Hydroxypropyltrimonium Chloride, Sodium Chloride, Potassium Sorbate, Parfum, Aloe Barbadensis (Aloe Vera) Leaf Juice, Citric Acid, Zingiber Officinale (Ginger) Root Extract, Punica Granatum (Pomegranate) Extract, Lycium Barbarum Fruit Extract (Goji Berry), Commiphora Myrrha (Myrrh) Extract, Camellia Sinensis (Green Tea) Leaf Extract, Panthenol, Butyrospermum Parkii (Shea Butter), Tocopheryl Acetate, Phenoxyethanol, Parfum, Lactic Acid.